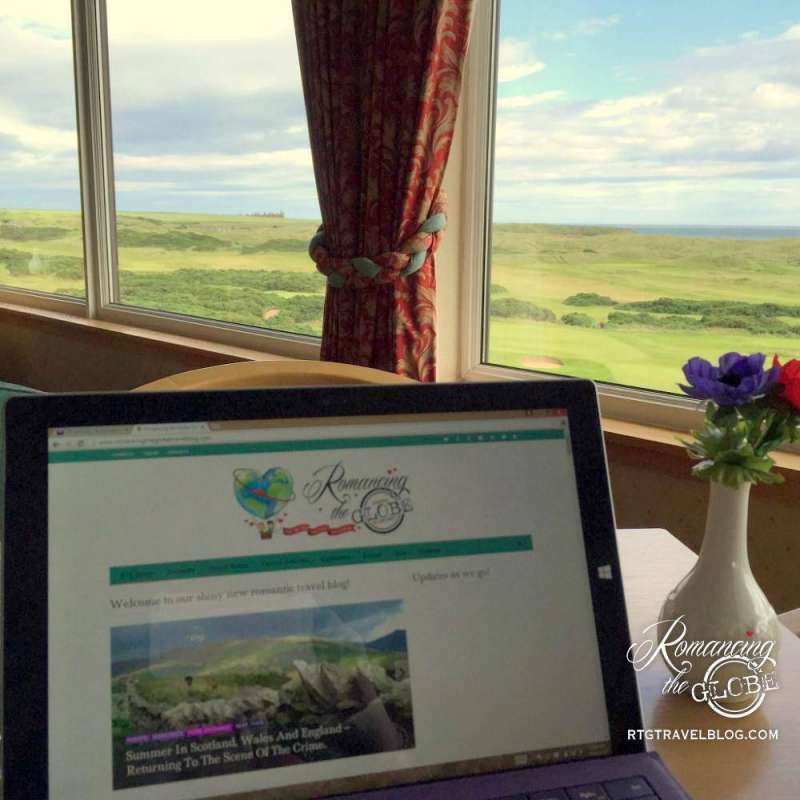 Cruden Bay, Scotland – Waaaaaay beyond expectations! Amazing is an overused descriptor, but in this case it applies. During our month-long home exchange to Edinburgh, we lucked into a very special experience. Cruden Bay and the Bullers of Buchan areas were not in our plans to visit, but that’s where fate comes in. My poo is bigger than yours! Anna playing hide-n-seek with an elephant! It all started with elephant poop! No, really!! We were shoveling elephant poop during a week of volunteering at Elephant Nature Park, in northern Thailand. You know those people who can’t help but be competitive at anything they do? From sports to naming bands to vacuuming…they seek out rivals to compete! That’s Tom and our new co-volunteer friends, especially Anna. It’s a bit dangerous around them with pitchforks, shovels, hoses and ele poo, but quite entertaining! As we worked and laughed we also shared stories, of course, and we mentioned our plans to visit Scotland. 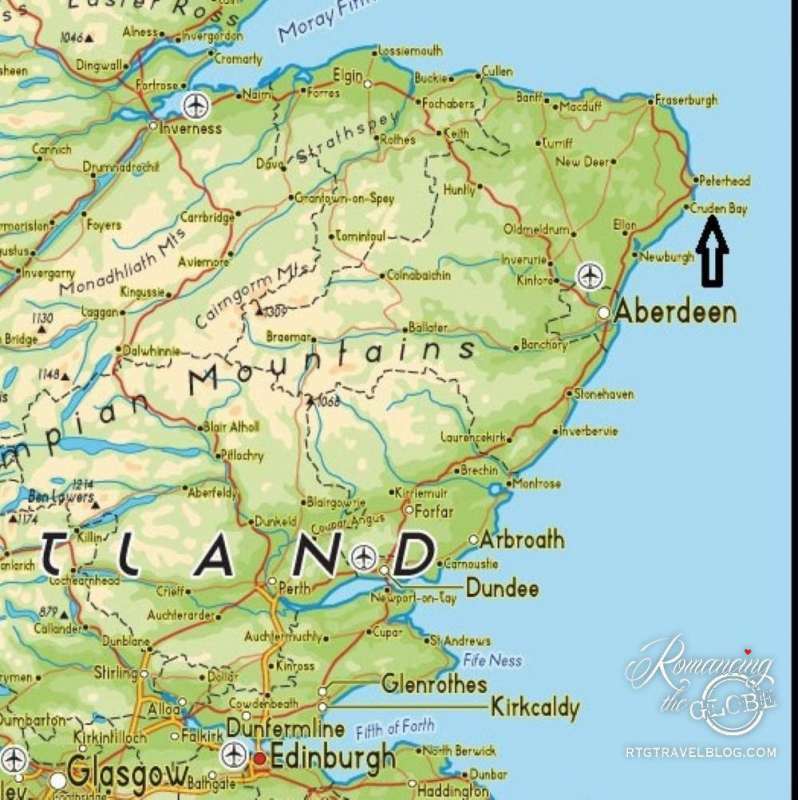 Turns out Anna’s dad lives in Cruden Bay (about 3 hours north of Edinburgh), loves to play golf, and she thought he might enjoy a round of golf with Tom. Tom knew the reputation of the Cruden Bay Golf Club and Sheila knew she could find something fun to do nearby (like patiently waiting for men in kilts to walk by). Knowing how smart, funny and charming Anna is, we presumed her dad must be reasonably good enough company for a day of golf and maybe a dram of whisky. After a few emails with Anna’s dad, John, he graciously invited us to stay at his cottage. How bad could it be? A road trip to a place we knew nothing about, staying at a home we knew nothing about, and with a complete stranger? The town of Cruden Bay is darling and small (about 2,000 residents) with a long, unspoiled beach. Sheila saw that shopping wasn’t an option, but was quickly distracted by the area’s true attraction. Our host’s cottage is located about a mile north in an area known as Bullers of Buchan. A small cluster of homes balances on the edge of sea cliffs, awhoosh with nesting sea birds. Yes, awhoosh. No other word describes the feeling of being amidst hundreds of speeding, shrieking, swooping, diving sea birds! The Coastal Trail is right out his front door – turn right (south) and follow the trail for a sea arch and birds galore – turn left to see a different sea arch, more sea birds, and some dramatic coastal erosion and rock formations. WATCH YOUR STEP here. There are no guard rails and the ground is uneven and muddy which enhances the feeling that you’re the first people discovering this astounding place! But we weren’t. Cruden Bay is said to have been the site of a battle in which the Scots defeated the Danes in 1012, thus the name was derived from the Gaelic Croch Dain (Slaughter of Danes). Puffins nest here from April to early August, but the locals hadn’t seen any for a week or more, so it seemed they had already moved on. We were delighted to find a few stragglers! Such joy to watch them! Also, we thought we saw a pod of dolphins, but a local corrected us – they were actually minke whales! Enjoy this cacophony with sound! Between Bullers of Buchan and the town of Cruden Bay are the sprawling ruined remains of Slains Castle. This castle is our favorite kind: unsupervised and easy to explore (and free) with a structure and cliffside location that keep your imagination busy! Some believe Slains Castle inspired Bram Stoker’s Dracula since Stoker was a regular guest at the Kilmarnock Arms (where we dined with John and would have stayed if not his guests). In fact, the locals refer to it as Dracula’s castle. Also, Stoker’s novel The Mystery of the Sea and some short stories have Cruden Bay as their setting. A film crew was there when we were and rumors hinted at filming for Season 6 of GOT and / or Netflix’s The Crown. The Pros may cancel due to the wind, but not Tom and John! Cruden Bay Golf Club is world famous links golf. In fact, it’s ranked in the Top 100 in the world on many lists. The course and the setting are magnificent. Our tee time reservation happened to be the same day it was so windy that the British Open (2 hours south in St. Andrews) cancelled play for the day. Tom was so happy John didn’t want to cancel! He considers the course to be one of the top 5 he has ever played and he managed to shoot an 85 in spite of the wind. Sheila enjoyed the Clubhouse with views of Slains Castle, the coastline and the course. The staff was friendly and we returned for dinner twice, including the Sunday Carvery. Yum! John gave us great advice for fun stuff to explore in the area – all where land meets sea. It was an invigorating day! A 50 foot quartzite rock with a large natural sea arch. Pennan was the film site for Local Hero (remember the red phone box?) and Gardenstown is home to a whale and dolphin rescue centre. Crovie is a small village with one single row of houses on such a narrow ledge that cars must be parked at the south end. Have you ever wanted to try paragliding? Check this out! Seals swimming in the bay near Newburgh. They reminded us of playful puppies. 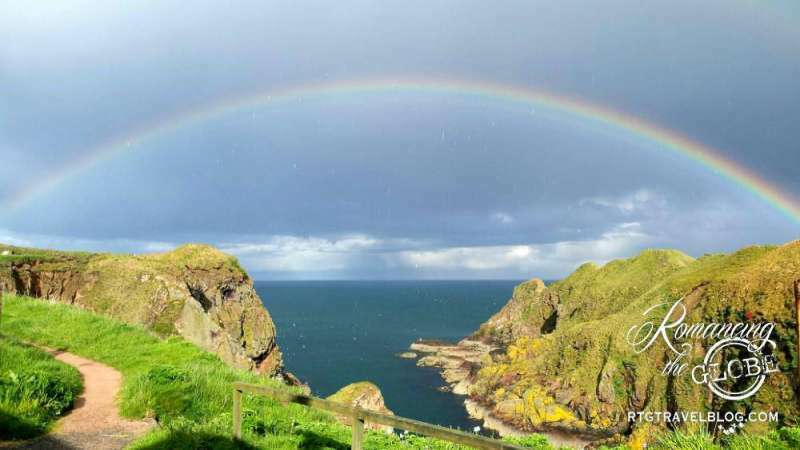 Near Stonehaven – dramatic clifftop fortress with both heroic and dark history. Truly awesome setting. On our way north, we chose to meander through the western side of Cairngorms National Park. We’re so glad we did, especially since it was raining on our return south, so we took the motorway. 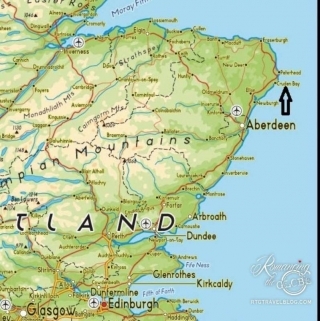 Although the use of Scottish Gaelic has declined and is now spoken by only about 60,000 people, signs in northern Scotland add the Gaelic names. We love figuring out the origins and meanings! We thought Tom’s ancestors had history here, but the greeter set us straight (rather firmly). Good food, a hike to waterfalls that were immortalized in a poem by Robert Burns, and our Robertson clan museum. The smallest, best preserved of four barracks and a horse barn built in 1719 after the 1715 Jacobite rising. A cute village with the famous packhorse bridge. Built in 1717, it is the oldest stone bridge in the Highlands. We stayed one night at the Balsporran Inn near Dalwhinnie – a great setting and a good breakfast, but we give it below average marks other than that. One highlight was dining with a couple in their 80’s who are avid munro (mountain) climbers! We offer many thanks to John, our host, for his warm hospitality and terrific company. And many thanks to his daughter Anna (of elephant poop fame) for her suggestion and follow-through to make it happen! Hopefully, we’ll get to meet John’s beautiful wife (Anna’s mom), Helen, the next time and we’d love for them to visit us in Colorado (hint!). If you want to get away from the summer crowds and experience amazing coastal scenery, consider Cruden Bay. Don’t let the fact that you’ve never heard of it stop you! In addition to Cruden Bay, Tom played nearly a dozen rounds of golf in the Edinburgh area and wrote about why Scotland Golf is better – 18 reasons.
? What unexpected invitation turned into a special memory for you? Hi Tom & Sheila, I enjoyed the extra pics I had not seen before. I love reading all about the area. You make it sound like so much fun!! Enjoyed all the added pictures from the Scotland trip. Was puzzled about the mention of the Robertson museum, but couldn’t find a picture of it. Good job. Hi Nancy! Glad you liked the photos, thanks. We have two photos of the Robertson (Donnachaidh) Clan museum, but neither are great – except for the handsome man in front 🙂 The statue of the kilted Scotsman is in front of the muesum. Looks like this was a fabulous time. I heart puffins!!! A great story and all the more interesting having known John for 30 years. 30 years! You have my jealousy AND my sympathy. Just kidding! We sure adored him and he was such a gracious host, even though he missed Helen. Thanks for reading our story. Hi, enjoyed reading your lovely post regarding Cruden Bay with amazing photos, shared this post from my Sister Helen and of course my Brother in law John and Niece Anna. Helen was staying with us at the time of your visit, where we live in a village near Nottinghamshire, five minutes from Newstead Abbey ( famous re Lord Byron ). Perhaps you will visit there one day ? All of the above are joining us for Christmas holidays, so looking forward to a lovely family gathering. Hi Vikki! I can only imagine how much fun your family will have all together at Christmas. Enjoy! Yes, we do hope to visit Nottinghamshire area some day. We’ve heard great things about the Peak District National Park also and hadn’t heard of Newstead Abbey, which looks beautiful! You live in such wonderful place. Thanks for reading and sharing our story!